Audrey Wibowo is much like other 10-year-old girls — she likes playing music (violin, harp, and piano are her specialities), she loves reading books (fiction is her favorite genre), and she enjoys chatting with friends and spending time with her family. But Audrey also realized very early that, ”Peace begins with me, and it is contagious.” This realization has led Audrey to share a message of peace with other children and with adults in a big way! Audrey learned about Mattie J.T. Stepanek and his message of hope and peace from her mom, a teacher, and from her Montessori School in Indonesia. She was very excited to be registered as one of Mattie’s Peace Club Kids and to receive Mattie’s books and poetry as a gift from her mom (her favorite Mattie poem is “About Friendship” because it teaches people how to be a good friend to others). As a 4th grader, Audrey chose to deliver a presentation about Mattie and his Foundation, complete with activities and a slide show, for her school’s annual “Peace Day” project. 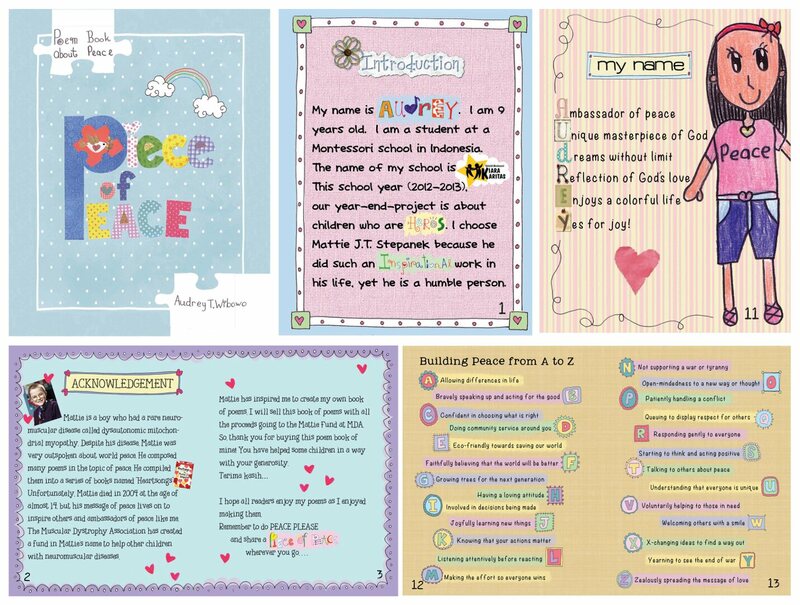 Audrey was also inspired to create her own book, “Piece of Peace,” and use proceeds from the sales to support peace education, including the work of Mattie’s Foundation. And, she was one of the first “Peace Club Tweens” to receive a Peace Activity Certificate from Mattie’s Foundation. -Now, as we celebrate individuals and groups who give of their time, their talent, and their treasure to support and share peace with others, the Mattie J.T. Stepanek Foundation honors with deep appreciation – Audrey Wibowo – our Winter/Spring 2014 Peace Seeker Spotlight. I am Audrey and I am 9 years old. I am in Grade 4 at Montessori Kiara Karitas in Indonesia. [NOTE: Since this letter was written, Audrey has turned 10 years old and is now in Grade 5]. I am glad that I can write to you in person. I learned about Mattie from school. My teacher talked about him on Peace Day. My mom bought Mattie’s books and I like to read his poems. My mom is also a teacher in my school. She has collected Mattie’s books a long time ago. She bought the new book written by you. ‘Messenger’ and another book, ‘Just Peace’ a year ago. Mattie has inspired me about peace. I want to spread peace everywhere I go. Peace begins with me and it is contagious. Mama Peace, please take care of yourself. I am soooo happyyy to be able to write to you…. 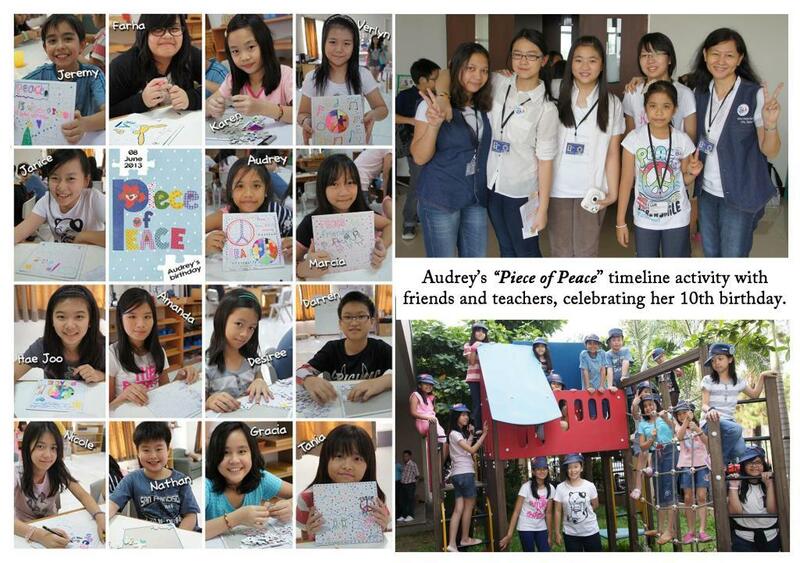 TOP: Audrey with her “Piece of Peace” book. BOTTOM LEFT: Audrey with her parents. BOTTOM RIGHT: Audrey giving her Peace Day speech on Mattie J.T. Stepanek. What is the name of your Peace Activity? In our school, we celebrate UN Day every October 24th. We usually read one of Mattie’s poems. My friends and I always enjoy his poem:) All teachers in our school know about Mattie and how he has inspired people to bring peace in life. My mom likes to share Mattie’s wisdom and peace to her teacher-friends and parents. She is always amazed by Mattie’s thoughts and dedication towards world peace, yet he is a humble boy. My mom like to say that Mattie’s message is really good fit in Montessori school, because Montessori is peace education. For YEP (Year End Project) this semester, my teachers asked the students to choose any child (below 18) who is inspiring as a topic of our individual project. Of course I choose Mattie!! The presentation day of this project will be May 18, 2013. The presentation will not only presenting about our heroes but we also need to inform what we can contribute to others after being inspired. What is the mission or purpose of your Peace Activity? The purpose of Audrey’s Peace Activity is to use a class project/assignment as an opportunity to teach youth and adults about peace. Through a presentation on Mattie’s life, a display table with books and posters and photos about Mattie and from Mattie’s Foundation, and through interactive discussion and activities, those attending the presentation will learn about Mattie as a peacemaker, and about how each person can choose to be a peacemaker like Mattie, even if life is difficult. This Peace Activity is also an opportunity for Audrey to share her poetry book, Piece of Peace, which she is selling to raise money for both Mattie’s Foundation and for the MDA (to support other children and families living with neuromuscular diseases). I have discussed with my teacher about my project presentation. On the presentation day, I will present about Mattie’s life and work and how he inspired people in the world about peace, especially me! Since my mom ordered a T-shirt from Mattie’s Peace Shop, I think I will put that on as well. 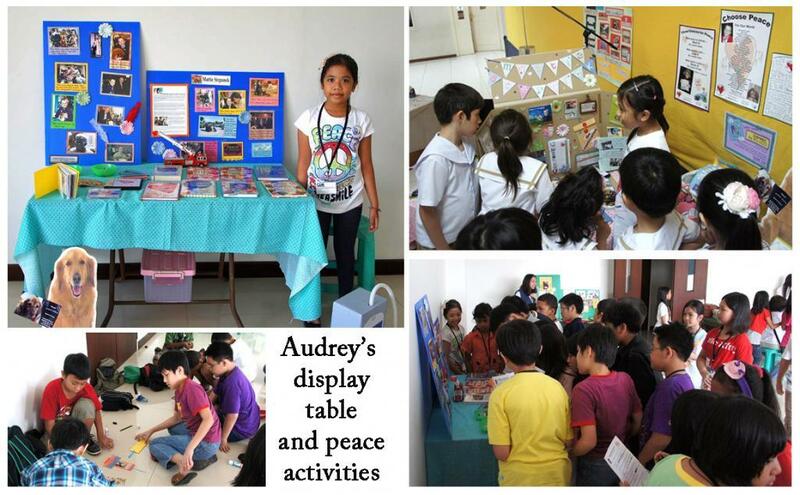 Audrey’s presentation for her school’s Peace Day, Spring 2013. My parents searched for a printing company and we ordered 200 copies of books. I started to sell my poem book during our school Book Week in mid March. The book price is IDR 90.000 each. Some people paid less and some paid more. Up to now, there are 113 books sold and I had collected IDR 10.000.000 so far (maybe around $US 1000). The money will go to Mattie’s Foundation to help spread peace, and also to MDA to help other children who suffer from muscle disease like Mattie. My last day of selling is probably my presentation day. Hopefully I can sell more books so more money can be donated. Mama Peace, I have some questions to ask you. Was Mattie really involved in Sunday School as well? Was he teaching the little kids? How did he do that? Is Mattie in the process of canonization? How is it going? I am also a Catholic and my mom is a Sunday School teacher, too. She also helps organizing things at church and is involved in youth activities at church. My mom is very kind, she sometimes travels to train Sunday School teachers in small cities or villages around Indonesia. Besides, she teaches street children who can’t go to school because they are poor. I sometimes go with her, too. Also, do you have any suggestions for my presentation? Choice 3: Peace Bringer – Reach Out with Mattie’s Message & Yours! Audrey’s display table and activities that were a part of her peace presentation. How did your Peace Activity and presentation go? NOTE: We encourage families and adults to be involved with and support youth in their Peace Activities. The goal is to support young people as they learn to move from “attitude to action” and embrace peace as a way of “being” not just “doing.” Parents, educators, and other adults are welcome to be help our Peace Club Tweens with the plans and summaries of their Peace Activities. We want youth to fully participate, even create the activity if they are ready, but also welcome family and extended participation and written feedback. The presentation at school on May 18th, ran very well. Audrey was able to speak confidently and clearly about Mattie and his message of peace. After all children presenting using power point finished, they were sent to their booth so that audience (parents and families) could come and see their board or display. During this exhibition, parents could also ask questions or just look detailed information on the display. Audrey’s booth was crowded with friends and parents to come and know more about Mattie, his life and his message. The audio of Mattie reading his poems was played on and on. Audrey was busy answering questions. It was great to see this. Audrey also gave peace bracelet to those who come to her booth. The presentation day was the last day Audrey sold her book as well. She finally sold 163 books total. Audrey, my husband and I have discussed of how to distribute the money for. 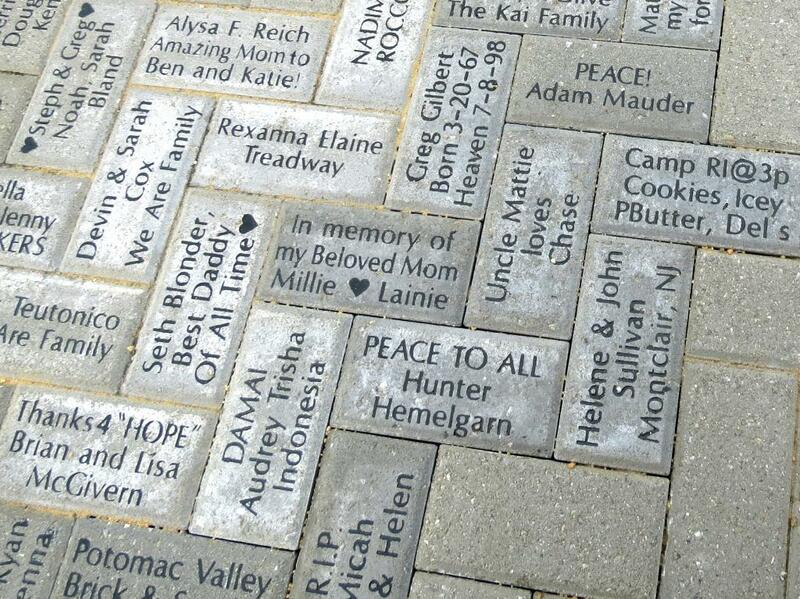 Audrey’s brick in Mattie’s Peace Garden, Rockville, Maryland. 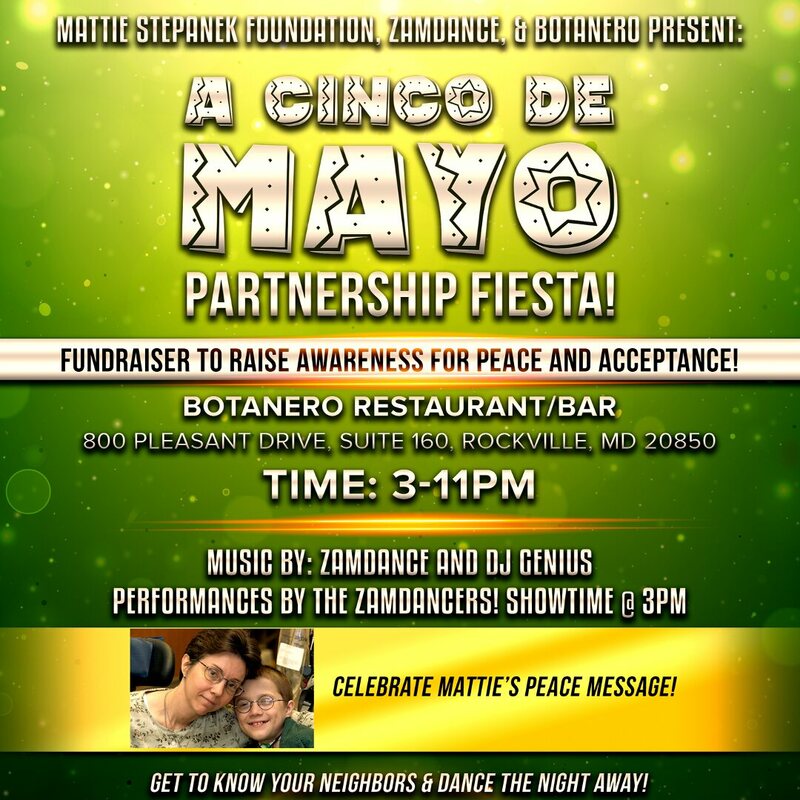 We decided to use it to support projects for hope and peace – including support for Mattie’s Foundation. Audrey will be placing a peace brick ($179) in Mattie’s Park & Peace Garden, and donating funds to Mattie’s Foundation ($661). She will also be supporting other organizations, including MDA. As this is Audrey’s project, I want her to get involved in as much activity as possible, so we will support her in going to the bank and making the transfer of funds, rather than using my credit card. I also want to tell you that on Sunday May 19th, Audrey also presented Mattie in front of First-Holy-Communion children-class. The children were so amazed with Mattie’s wisdom and humility. There were also some other saints that were presented, like St. Frances Assisi, Padre Pio, St. Bernadette and Mother Teresa. Audrey’s presentation was about Mattie, and the other presentations were done by her friends. This team (we call it CIA= Catholic Intelligence Agency) also prepared boards for children to see and observed after presentation. It seemed all children were interested in Mattie and Audrey’s booth was packed with children, whereas other booths were visited by fewer children. Before the children went home, each of them was asked to choose one character and make a book mark; they could use some pictures and quotes we have prepared before. The pictures and quotes of Mattie were the favorite and finished at glance! Children rushed to get Mattie’s picture and quotes to be put on their bookmark. For me, it was awesome to see those children able to learn from other child like Mattie. I was grateful for that! Thank you for what you do to keep spreading peace among us, Jeni. I am blessed to be part of your work. 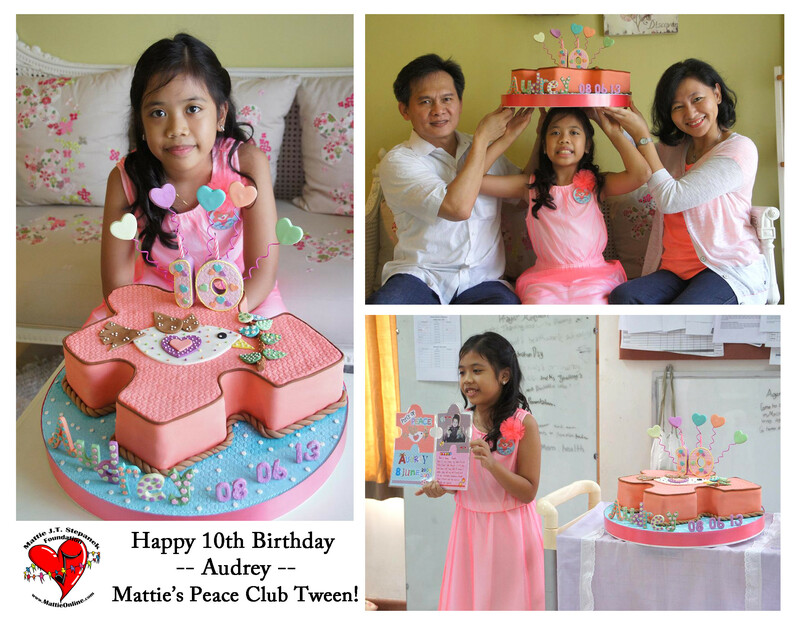 Audrey’s 10th birthday — a celebration of peace! Now you have done a Peace Club Tween Peace Activity – What Next? 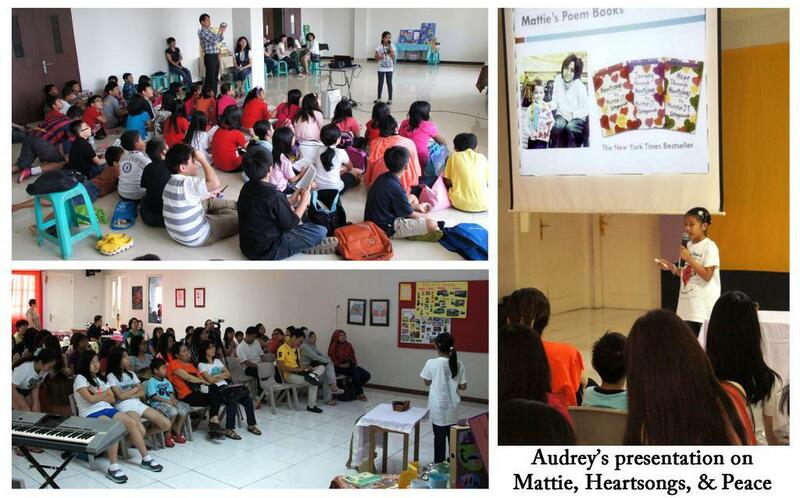 Since her presentation on Mattie and her Piece of Peace book fundraiser, Audrey has also shared about Mattie’s life and message of peace with her Sunday School class (see note above from her mom, Ari). Also, Audrey celebrated her 10th birthday during June!!! 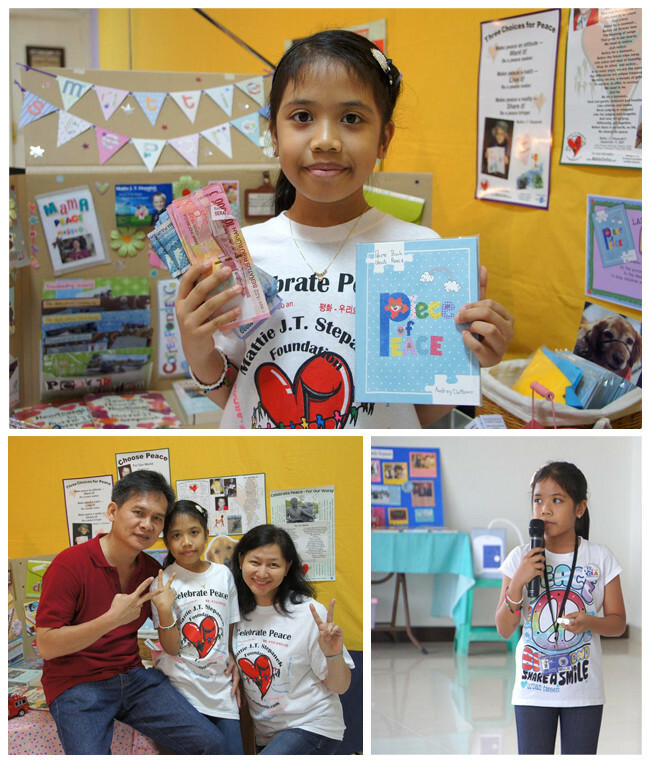 She chose to celebrate her birthday with a theme for the coming year – PEACE. for being a Peace Seeker.